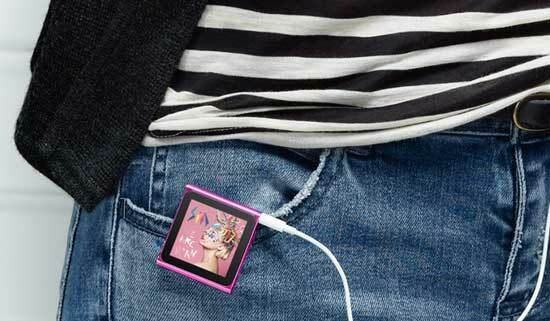 Just the other day some rumours surfaced, and photos did the rounds, of some new square cases for the new shape of iPod nano – the 6th generation iPod nano. The rumours turned out to be true, Apple’s most shape-shifting iPod is now square. Almost square actually. It’s 37.5 mm high, 40.0 mm wide, and 8.78 thick. Not only that, it now has a touchscreen, just like it’s bigger sibling, the iPod Touch. It’s a 1.54 inch diagonal screen, 240 x 240 pixel resolution, packing 220 pixels per inch. So you can swipe screens, rearrange screens, control music, all by touch. There are buttons on the top of the nano, for sleep/wake, and volume control. In addition to the touchscreen interface, the nano also packs the Shake to Shuffle feature. Enable it, and all you need do to is give the nano a shake to listen to another song from your library. Another music option is the FM radio. On-screen the artist and song you’re listening to will show on the display, as will the name of the programme you’re listening to. The battery will play back 24 hours of music on a full charge. A full battery charge takes 3 hours, or you can use the Fast-Charge option, that will give you 80% battery in 90 minutes. It also brings back the in-built clip from the iPod Shuffle of a couple of generations ago, allowing you to easily and quickly attach the nano to your clothes, bag, etc. If you’re blind, or vision-impaired, there are a few features for you. VoiceOver tells you via a synthesised voice what song and artist you’re listening to, or what part of the nano’s menu you’re in. The screen colour can be changed too, from white background to a high-contrast black background. 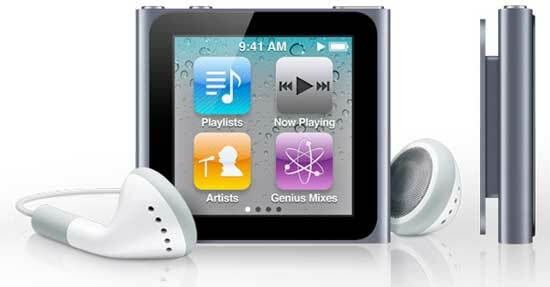 The new 2010 version of the iPod nano will be in stores next week.